As we approached the millennium, Sore Fingers Week was just about to celebrate its fifth birthday and was still a relatively new experience for the British Bluegrass scene. One of the issues facing us was the lack of fiddlers attending the event. Asking both potential students here and several of the tutors who had taught at Kingham about who might help us get this class going, they all made the same recommendation: “You need Fletcher Bright”! This wasn’t a name I was familiar with but a bit of digging soon established that we would be dealing with one very special character. Fletcher kicked off the fiddle class and filled it up with students and gave generously of his time and experience. No one has studied Bluegrass fiddle players just like Fletcher has. At the end of that first week, I remember how all his students were totally inspired by his teaching. Needless to say, he was invited straight back to teach the following year. He was a perfect Southern Gentleman with a great sense of humour and though not a professional musician, it was obvious that he was a highly respected member of the US Bluegrass scene. He had a great sense of humour and was as quick witted as anyone. I’m sure he enjoyed his experiences at Sore Fingers Week. It’s unlikely we’ll meet the like of Fletcher Bright anytime soon, a real treasure and we are glad and proud to have met and worked with him. JOHN WIRTZ contacted Fletcher's family on hearing the sad news and they passed on this, their family obituary. Fletcher White Bright, 86, died peacefully at his home on Lookout Mountain on December 25th, surrounded by his family. Born to Margaret White Bright and James Gardner Bright on June 27, 1931, Fletcher was a lifelong resident of Lookout Mountain, Tennessee, and a devoted member of the Church of the Good Shepherd, Episcopal, Lookout Mountain, where he served on the vestry, sang in the choir, and regularly lent his fiddling skills to the music program. He attended the Bright School, McCallie School and Davidson College in Davidson, North Carolina, where he earned a B.A. in Economics and was a member of the Phi Delta Theta fraternity. After graduating in 1953, he went on to earn his Masters in Business Administration from the University of Chattanooga and his law degree from the McKenzie College of Law. Shortly thereafter, he obtained an MAI designation from the Appraisers Institute in Cambridge, Massachusetts. Married in 1956, Marshall and Fletcher would make their family home on Lookout Mountain and welcome to the world their five children, George, Lizzer, Frank, Ann and Lucy. Fletcher joined his father’s real estate firm, Gardner Bright Realtors, and tackled his career with great energy and vision, growing the company from a small residential firm to a full-service residential and commercial development company with offices in Chattanooga and Atlanta. He taught college level classes in real estate, fundamentals of real estate law and real estate appraisal. Over the decades the name Fletcher Bright has become synonymous with Chattanooga real estate, and his old fashioned “hand shake” style is familiar to anyone who had the pleasure of doing business with him. One of the world’s great traditional old time and bluegrass fiddlers, Fletcher was a lover and supporter of all things bluegrass, and his vast repertoire of fiddle tunes is legendary. His interest in music began at a young age, first on the piano, then the violin. Much to his mother’s chagrin, his classical music studies turned to bluegrass when he first heard Bill Monroe on the radio as a student at McCallie School in the 1940s. Fletcher and fellow classmates Ed ”Doc” Cullis, Frank McDonald, Ansley Moses and Sammy Joyce formed the band that would later become the Dismembered Tennesseans, kick-starting a seventy year journey of music, entertaining, travel and just plain fun. Over the years Fletcher and the band played at countless fundraisers, church events, parties, weddings, rehearsal dinners and festivals across the country. He held weekly picking parties in his home for decades. He has taught fiddle from coast to coast and in England and Canada. He has produced and co-produced numerous CDs, and for the past eleven years he has sponsored the free 3 Sisters Bluegrass Festival along with his son George. Fletcher’s passion for bluegrass inspired hundreds of would-be musicians to pick up an instrument and join the party. 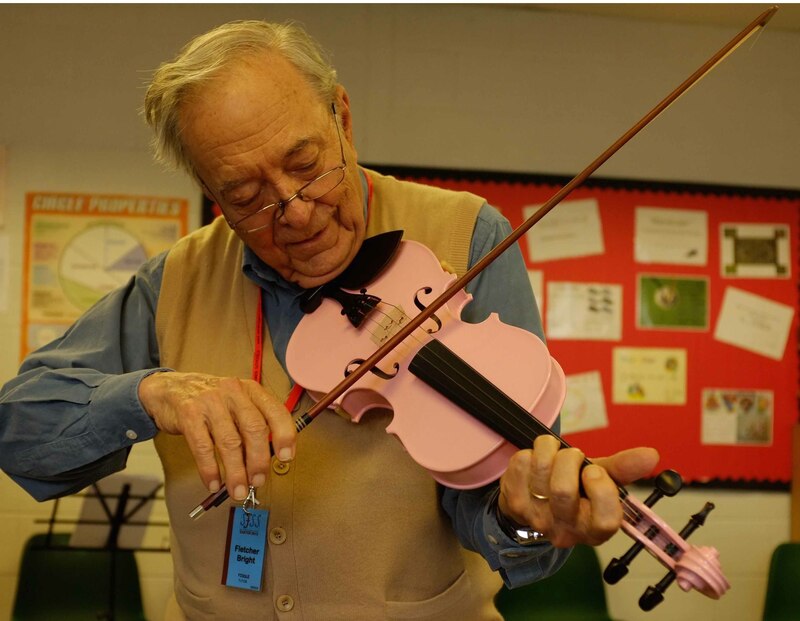 Throughout his lifetime he won many awards and honors but perhaps the most meaningful was his recent Distinguished Achievement Award bestowed by the IBMA (International Bluegrass Music Association), recognizing his lifelong dedication to learning, playing and teaching bluegrass music. The family wishes to thank all members of the Dismembered Tennesseans, past and present, who brought so much joy, music and pleasure to Fletcher’s life: Frank McDonald, Ansley Moses, Ed “Doc” Cullis, Laura Walker, Don Cassell, Bobby Martin, Brian Blaylock, Louis Wamp, Mike Parham and band caretaker extraordinaire Cindy Pinion. Fletcher’s love of music was in no way limited to bluegrass. He was an accomplished jazz and boogie woogie piano player and continued to be an avid student of jazz theory. Walking into his home, one might expect to be greeted by a Bill Monroe tune only to be surprised by a beautiful rendition of Stomping at the Savoy or Satin Doll on the piano. Fletcher served on the Boards of The Bright School, McCallie School and the International Bluegrass Music Museum. He was the recipient of the McCallie School Distinguished Alumni Award (2000); the Chattanooga Area Manager of the Year Award (2001); the Tennessee Governor’s Award for the Arts (2005); the Outstanding Philanthropist of the Year Award (2008); the Ruth Holmberg Arts Leadership Award (2016); and the International Bluegrass Music Association Distinguished Achievement Award (2017). He is a past President of the Tennessee Association of Real Estate Boards; a former Director of the National Association of Real Estate Boards; and a past President of the Greater Chattanooga Association of REALTORS. At the time of his passing, he was a nominee for an Honorary Degree from Dickinson College in Carlisle, Pennsylvania. A true Renaissance man, Fletcher pursued his many interests with passion and vigor. He loved bass fishing and took great pleasure in his biannual fishing trips on the Suwanee River. An accomplished pilot with over 47 years’ experience and 6,500 hours, he held instrument, multi-engine and commercial ratings when he voluntarily relinquished the left seat at age eighty. But perhaps what brought him the most joy was traveling to Pawley’s Island, South Carolina, with his family and friends, a summer vacation he took for 83 years. Fletcher’s life was a richly woven tapestry of love, family, music, work, humility, faith, humor and gracious Southern charm. He lived fully, gave freely, and laughed often. We may never know how many lives he touched with his kind and generous spirit, profound wisdom, and teacher’s heart. He was preceded in death by his parents, Margaret and Gardner Bright; his wife, Marshall Soyars Bright; and his siblings, Ann Bright Govan, Lucy Bright Thatcher, George Thomas Bright and James Gardner Bright. He is survived by his five children, George Thomas (Anne) Bright, Lookout Mountain, Georgia; Elizabeth “Lizzer” Bright (Scott) Graham, Lookout Mountain, Tennessee; Franklin Soyars (Paul) Bright, Bluffton, South Carolina; Ann Bright (Greg) Monk, Chattanooga, Tennessee; and Lucy Bright (Mark) Griffin, Dalton, Georgia; and seven grandchildren, Marshall Ratliff Bright, Jones Raymond Graham, Eleanor Stafford Bright, Lucy Ann Graham, Elizabeth Nicholson Graham, Katherine Dyer Griffin and Fletcher Bright Griffin. He also leaves behind his dear friend, Mimi McDonald, and lifelong friend, Stud Martin. .In lieu of flowers, the family asks that donations in memory of Fletcher be made to the Church of the Good Shepherd, 211 Franklin Road, Lookout Mountain, Tennessee 37350, or the charity of your choice. The family wishes to thank Mary Jo Guffey, Pam Matthews and John Hartline for their many years of loving and dedicated service to the family. They would also like to thank BrightStar Care Chattanooga and Prestige Senior Homecare for the competent and compassionate care they provided, especially Bill Gauntt whose steadfast devotion and friendship meant so much to Fletcher and his family. Arrangements are by Wann Funeral Home and Cremation Center, 4000 Tennessee Avenue, Chattanooga, Tennessee, (423) 821-7551. Share your memories, stories and photos at www.wannfuneralhome.com. Our most recent memory of Fletcher is from 2013, when he returned to Sore Fingers along with banjo virtuoso, Bill Evans with whom he had recently made a recording ('Fine Times at Fletcher's House'). JOHN BOSTON, no mean fiddler himself, was tasked with interviewing the pair of them for the British Bluegrass Music Association's magazine, British Bluegrass News. JOHN BOSTON: Fletcher, the audience really enjoyed your performance on stage last night with Bill – just fiddle and banjo. Could you tell us how you came to make the CD? FLETCHER BRIGHT: Bill and I have known each other for several years, though we don’t get together that often – he lives near Berkeley, California and I live in Chattenooga Tennessee.- that’s like coming from the US to UK – but we do cross paths at various festivals and teaching events. We’ve played together on stage at end-of-week concerts several times, and have talked for years about making a record – surely it’ll just happen – but it didn’t…..
FLETCHER: I can say this better than Bill. You know, I’m not a Spring Chicken, so I said if we didn’t do it soon, we might miss the opportunity altogether. BILL: So, then it moved up the top of my “to do” list. JOHN: A lot of the American players who have been over here seem to know Fletcher and respect his fiddle playing, and are keen to play with him. Is that right? BILL; Yes. We all love Fletcher, not only for his music but his personal example – he is always open to learning new tunes and playing anything that comes along. Also he has a very broad repertoire and we love to learn tunes from Fletcher. I love Flatt & Scruggs and there aren’t that many fiddlers who have studied that music. You have probably seen that band and knew the musicians? FLETCHER: Oh yes – I started listening to Jimmy Shumate, and you may not realise it, but that break we did on “Cabin in Caroline” [in Fletcher’s fiddle class] that was Jimmy’s, note for note. BILL: Did you know Arthur Smith? Did you record the bands and talk to them or just learn from records? FLETCHER: Chubby…he came from Florida and had more of a swing background. When Bill (Monroe) hired him, and he learned Bluegrass but he set the bar. He was one of the first fiddle players who could play in tune, and had almost a classical sound and of course, we still copy him today. Then Benny Martin came along and I listened to him. I like Benny Martin probably better than anyone. – in his peak days when he played with Bill Monroe, then Flatt & Scruggs. BILL: The Dismembered Tennesseans have been playing since around 1951? FLETCHER: No, long before then! Let’s see, when were you born Bill, to put it into perspective? FLETCHER: We were seasoned musicians, at least, musicians…. We started playing in the 1940s. JOHN: Bluegrass is reckoned to date from 1945? FLETCHER: When we started, the term Bluegrass wasn’t even coined, John - it was known as Hillbilly Music, though that might be a bit politically incorrect now, and it operated under the wider term of Country music. For a long time, Bluegrass came under the Country umbrella, but it’s since broken loose. JOHN; We had a revival here when Bonny & Clyde came out ..
FLETCHER: Then O Brother, Where Art Thou? But I can remember Bill Monroe…he was so hungry that he would go to a town and pick up a band while he was there to put on a show. Bluegrass music was not that popular then but I was a fan – like the song says, I was Country before Country was cool. JOHN: Tell us a bit about fiddle and banjo. They seem to go really well together. BILL: They would take a portion of the show and just devote to fiddle and banjo. Even early on they would do this – it wasn’t just something they thought of later. FLETCHER: Lester Flatt’s famous intro was that back in the old times, if you had a fiddle and a banjo, you had a band. BILL: But of course, in Old Time music fiddle and banjo went back much further, but what I heard first would have been what happened with the Lester Flatt & Earl Scruggs band. That’s more what we play – I’m a Bluegrass banjo player, although I love Old Time music, I don’t play it. FLETCHER: You get a whole different feel with an Old Time drop thumb banjo. JOHN; But you were playing quite a lot of Old Time tunes with Fletcher, in a Bluegrass style, which drives it along. FLETCHER: Drives it like - better than anything in the world. .
BILL: I feel really fortunate that I got to make this record with Fletcher and pushing him into it – there were probably several dozen banjo players could have done a better job – but I committed myself to the project. Fletcher chose the tunes, and we kind of learned them as we went along. We recorded them in his den, then the workmen were working next door and we had to move to his dining room. You couldn’t imagine a better environment to make a record. There was no pressure, we had fun. We’d play for a bit ,go and have coffee, then play some more. I’m really happy with it. Now we’re at this camp and will be doing two others this year, its fun to play the tunes we’ve recorded because they’re getting better now. What we played last night was really good – I enjoyed it. I’m doing more with the tunes because I know them better. Maybe we can do a bit of touring, come to England later? FLETCHER; Who knows? I mean, we’re open. BILL: If any reader wants to fund the tour at the level we need …..
JOHN; You’ve both taught at a lot of music schools and camps in America. How does Sore Fingers measure up with those? FLETCHER: Bill, you know I was here 12 years ago, and John was one of my pupils then. I modestly say that I made him the man he is today – fiddle-wise of course, I can’t speak for his domestic situation. But this place has really grown – more people, more classes, and as you say, the “tootors”- hope I pronounced that right – are well cared for, as compared to 12 years ago. FLETCHER: Oh yes. I mean, we have more time off – it was more like a Boot Camp . JOHN: Presumably in the States you expect more free time , fewer lessons? FLETCHER: No, they work us hard wherever we go, I’m sorry to report. CHRIS HARRISON, a Sore Fingers stalwart, has sent us this tribute. I first met Fletcher at one of the Augusta Bluegrass Tuition weeks in the early ‘90s. I found his style of tuition the most helpful I had ever encountered and was delighted with his warm and genuine personal style. I later found out how wealthy he was but it did not prevent him from being really friendly. He also was a real session animal and very welcoming to all us Brits. I remember first hearing Chinquapin played by him with Joe and John Herrmann. He also welcomed us (me and Gill, Kate and Chris Gimblett and Pete Wraith), to his house on Lookout Mountain, Chattanooga the following year when we made a road trip. He was always totally friendly and inclusive. That is why I recommended him to John Wirtz as a tutor. I was delighted he was able to bring his unique personal style to Sore Fingers. It enabled a lot of us in the UK to know him and benefit from his effective teaching style and the copious support material he always shipped in. He was playing with his longtime music partner Ed Cullis on the Sore Finger’s stage. Introducing one of the tunes he said, “Me and Ed (Eyuddd) sometimes practice but we ain’t looking to get any better…we’re just trying hard to hang on to what we got”. I was helping him onto the stage at his last visit (2013). He was then in his eighties. He said “I hope I don’t collapse. That might liven up the show”. He once wryly told me I didn’t need to attend his class any more. He ambiguously said he’d taught me all he could and that I’d graduated!! !